The childhood home of Wanda Gag, author of the still-popular children’s book “Millions of Cats,” was designed by her father, Anton, in 1894. The Gag family came from the country of Bohemia and were known for an unconventional lifestyle. Anton incorporated several artistic touches in his home, such as faux-woodwork and hand-stenciled wall borders. He had his artist studio upstairs under his skylight. Wanda went on to national fame with her books and artworks, and many of them are now housed in various prestigious museums around the world. 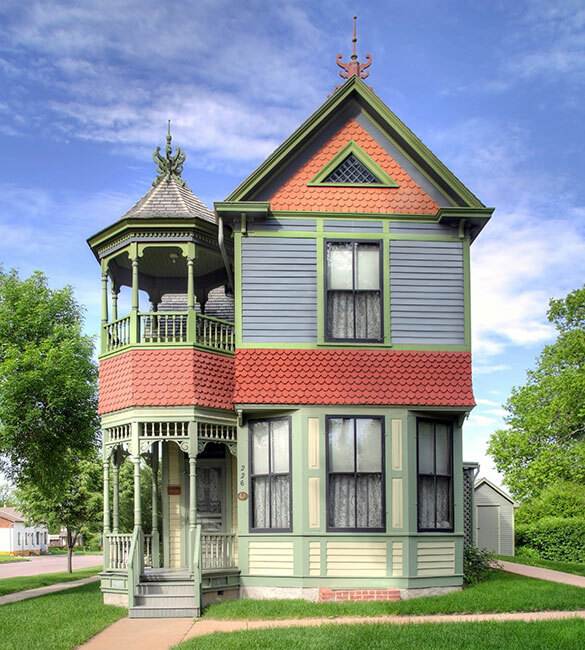 The Queen Anne-style home has been restored and now exhibits lithographs and paintings by Wanda Gag, paintings by Anton Gag and Flavia Gag, another of the talented Gag children. Also, books by Wanda and Flavia are displayed. The gift shop offers books by Wanda, about Wanda and the Gag family, T-shirts, sweatshirts. jewelry,etc. Location: 226 North Washington; handicapped accessible. Tour Hours: Weekends May-October, Saturday 10AM-4PM, Sunday 11AM-2PM. Contact for holiday hours. Year-round by appointment.